It’s still just barely Thursday here. The unfortunate series of disputes which have arisen since the opening of the Olympic games, not only between the Americans and the officials of the Amateur Athletic Association but between the athletes of other nations and the same officials, culminated this afternoon in an occurrence which threatened to wreck the Olympic games. It looked like anybody’s race as they approached the last turn, the three leaders being bunched. Their spurt for the final hundred yards was just begun, when suddenly a number of officials rushed on to the track, the tape across the finish was torn down and the race was declared void. 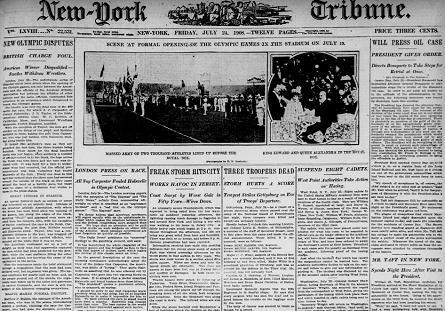 The American team has ordered their runners not to run on Saturday (in 1908, 24 July was a Friday) and released a statement detailing their objections. With three runners the Americans had a strong hand to play. They knew none of them was equal to Halswelle, so they were set to help one another on their journey. It is the writer’s view that all had a separate mission, although Taylor [who was far behind and who did not complete the race after the officials called it off] was no party to the plan laid down. He had no need to have it divulged to him. A huge thunderstorm hit New York and New Jersey. Three members of the National Guard were killed and twenty-six injured in an electrical storm that hit their camp in Gettysburg, PA yesterday. The military academy has suspended eight West Point cadets for hazing. President Roosevelt has ordered the Attorney General to retry the Standard Oil case. The paper seems to assume that readers know what it’s about; apparently an appeals court reversed an original decision that had gone against Standard Oil. Photos: from the opening ceremonies of the Olympics. The 1908 Olympics also prompted establishment of standard rules for sports, and selection of judges from different countries rather than just the host. One reason was the 400 metre run in which the US winner was accused of interfering with the British runner. Part of the problem was the different definition of interference under British and US rules. The race was re-run, but the Americans refused to participate. The British runner, Wyndham Halswelle, won by running around the track on his own because three of the four original runners had been American.